The 9-megapixel UC90 camera captures it all: brightfield images of superior quality, and up to 4K UHD imaging. Whatever your imaging needs are, expect no less than exceptional results in image quality, sensitivity, dynamic range, and color fidelity. Working with the UC90 is easy. 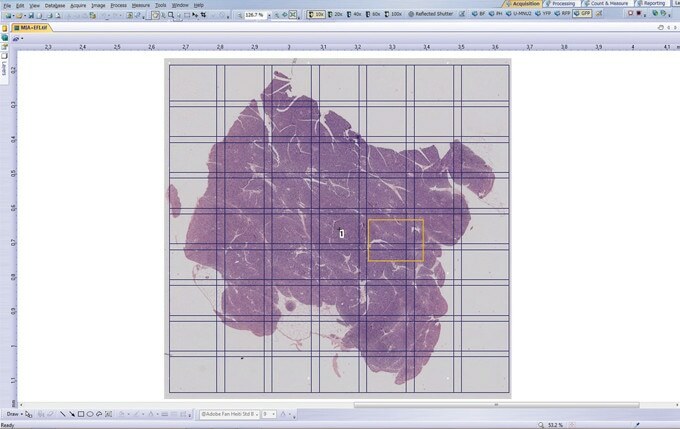 Simply switch between different observation modes with just a single click. The large field of view makes it easier than ever before to capture samples with full resolution and to take full advantage of your Olympus optics. In combination with its high frame rate, the UC90 offers fluid sample navigation and focusing, making it effortless and convenient to locate regions of interest right on your screen. See all the details and not the noise with OSIA, the exclusive Olympus noise reduction technology. 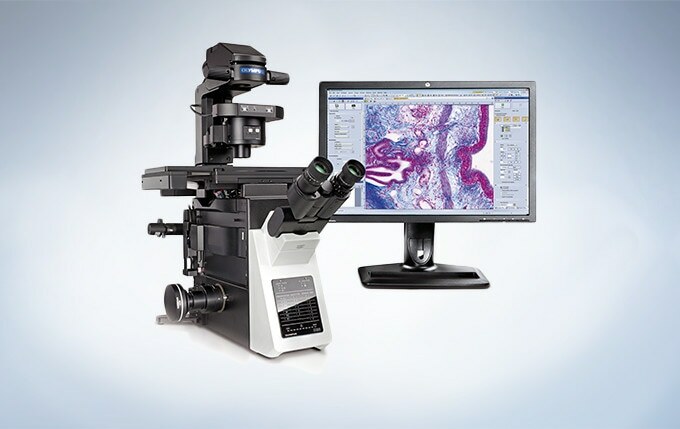 Excellent microscope imaging has never been as easy and versatile as with the UC90. The 1-inch high-definition CCD sensor of the UC90 covers almost the full C-mount image area. This translates into an unparalleled large field of view, which allows you to capture more of your sample with each single shot while exploiting the full resolution of your objectives. Equipped with a high-performance 9-megapixel CCD the UC90 captures vivid images with high resolution and exceptional clarity. Award-winning color reproduction technology working in real time and advanced integrated raw data shading correction offer additional benefits to get every detail out of the image. 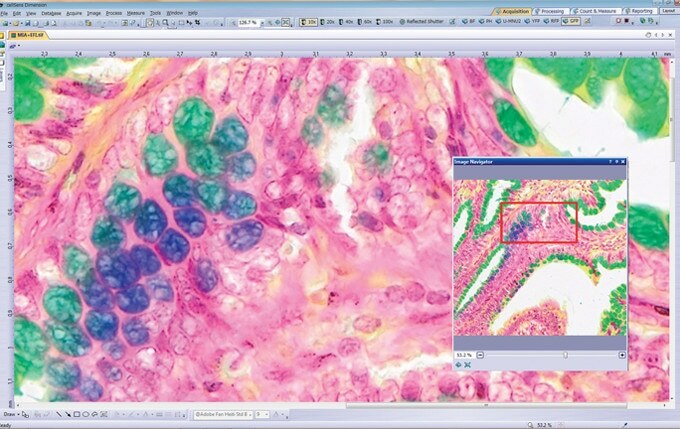 Unwanted color casts are automatically removed during live image acquisition via the integrated automatic white balance (AWB). The results are images with always perfectly balanced. 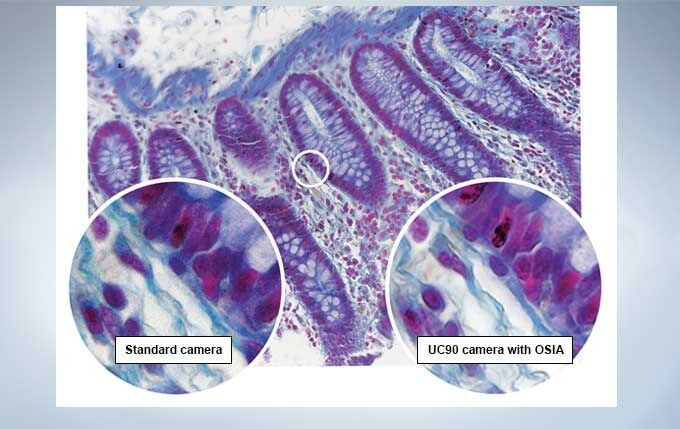 The UC90 features OSIA (Olympus Smart Image Averaging), the exclusive Olympus active noise reduction technology. 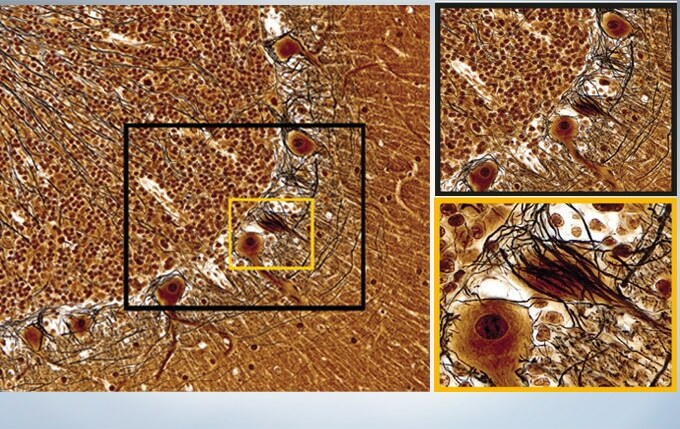 Using OSIA you can easily acquire clean and virtually noise-free images. OSIA works in live mode without reducing the frame rate or introducing artifacts, and without the need of active sensor cooling. 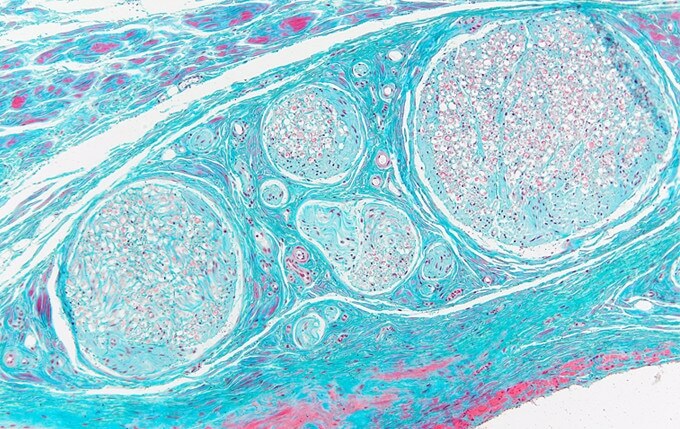 This powerful technology helps to always capture all the details of your sample regardless of imaging conditions and makes the camera suitable for a broad array of applications that traditionally were the domain of cooled cameras. In combination with the camera’s 14-bit depth, OSIA allows you to use the UC90’s extraordinary dynamic range to its full potential. The various acquisition modes of the UC90 offer full flexibility. With just one click you can switch between the different modes. Thanks to the Quad-Tap Readout technology used in the UC90, the camera achieves fast frame rates of up to 19.5 frames per second (fps) at full resolution. 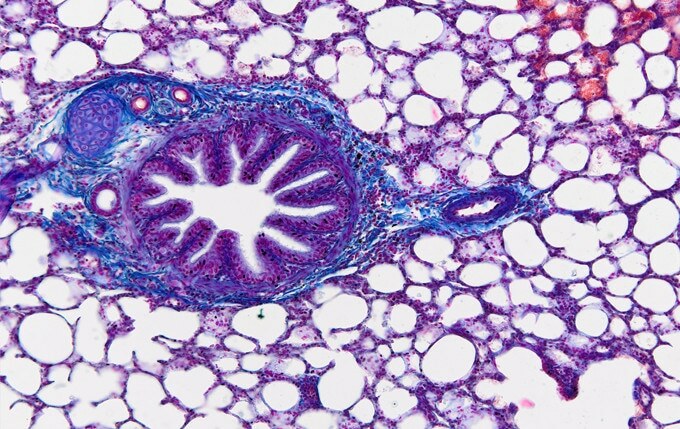 Bright field image of a lung section captured in color mode. Various binning modes give you the ability to increase the frame rates even further, making observation and focusing fast and easy with up to 57 fps in 4x binning allowing the capturing of fast processes. Dedicated new features make working with the UC90 even more convenient. The Fast Live function keeps the frame rate up whatever the exposure. 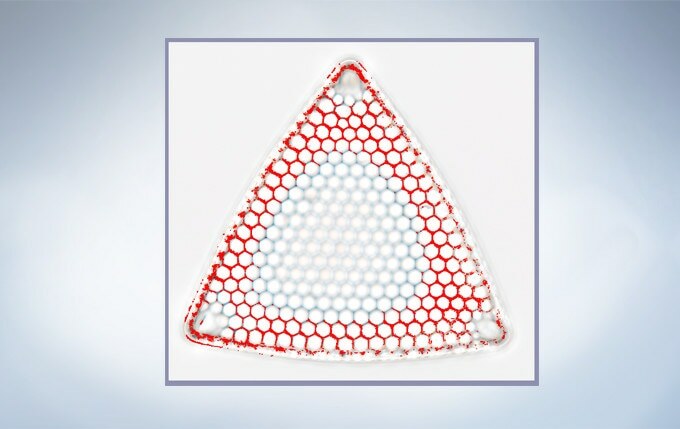 This makes fluid sample navigation and precise focusing easier than ever before, even in low light levels. Two user-selectable and customizable Focus Peaking modes directly highlight all focused areas in the live image, making it really simple to acquire images with best possible sharpness and quality. 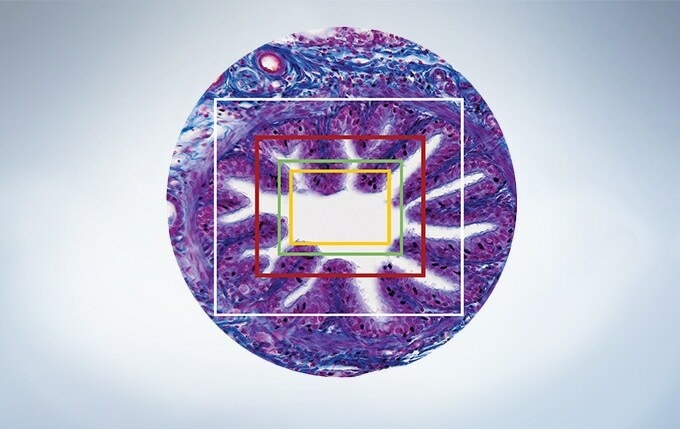 With automatic and manual image stitching and thanks to the large field of view, images from multiple sample regions can be quickly combined into a single high-quality Brightfield panoramic image. Directly see what’s in focus with the easy-to-use Focus Peaking function (The red color highlights the "in focus" parts).